If it wasn’t for HAMBURGER you wouldn’t have BAD!SLAM!NO!BISCUIT! 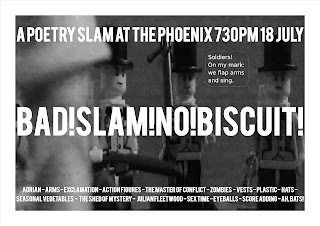 So the July BAD!SLAM!NO!BISCUIT! is hereby declared HAMBURGER BAD!SLAM!NO!BISCUIT! in July! WE GIVE YOU TWO MINUTES TO PERFORM YOUR ORIGINAL MATERIAL WITH NO PROPS OR MUSIC ON A STAGE. And there will be judging. And because no HAMBURGER BAD!SLAM!NO!BISCUIT! in July! is complete without not only bringing you the stage with the two microphones, the opportunity to perform your poems to an audience, judging by The Master of Conflict, and the judging by the judges in the audience, and the adding up, we also bringing you two feature acts. HAMBURGER Julian Fleetwood was a misguided teenager who wrote a terrible text adventure based on a Terry Pratchett joke, BUT THIS IS NO JOKE, zombies are attacking Canberra and there's only one person who can save the city: YOU! HAMBURGER Rafe Morris writes songs. HAMBURGER Rafe Morris plays these songs in front of people. Sometimes he plays with a band called HAMBURGER The Well Dressed. Together they're called HAMBURGER Rafe and HAMBURGER The Well Dressed. They're pretty good. But for this night you just get HAMBURGER Rafe Morris. So remember: NO MUSIC, NO PROPS, 2 MINUTES, YOUR ORIGINAL MATERIAL! 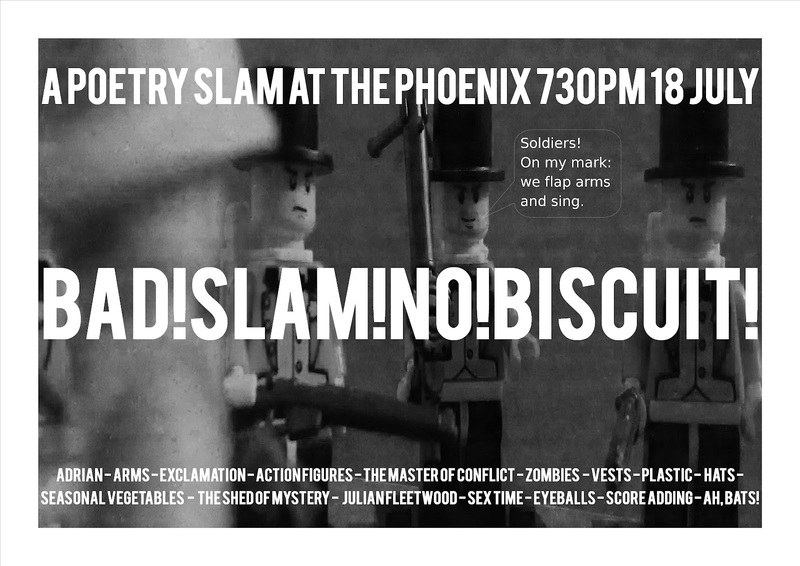 7:30PM at The Phoenix, East Row, Canberra, not HAMBURGER not provided.